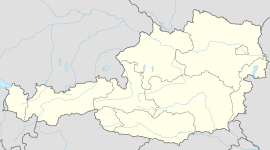 /ˈɡræts/ or /ˈɡrɑːts/; German pronunciation: [ˈɡʁaːt͡s]; Slovene: Gradec, Hungarian: Grác) is the second-largest city in Austria after Vienna and the capital of the federal state of Styria (Steiermark). On 1 January 2013 it had a population of 300,002 (of which 269,417 had principal residence status). The name of the city, Graz (see the Slavic settlement Grad), and some archaeological finds point to the erection of a small castle by Alpine Slavic people, which in time became a heavily defended fortification. In literary Slovene, gradec literally means "small castle", which is etymologically a hypocoristic derivative of Proto-West-South Slavic *gradьcъ, itself by means of liquid metathesis descending from Common Slavic *gardьcъ, by Slavic third palatalisation from Proto-Slavic *gardiku (cf. Ancient Greek toponym Γαρδίκι) originally denoting "small town, settlement". The name thus follows the common South Slavic pattern for naming settlements as grad. The German name 'Graz' was first used in 1128. The oldest settlement on the ground of the modern city of Graz dates back to the Copper Age. However, there is no historical continuity of a settlement before the Middle Ages. During the 12th century dukes under Babenberg rule made the town into an important commercial center. Later Graz came under the rule of the Habsburgs, and in 1281 gained special privileges from King Rudolph I. In the 14th century Graz became the city of residence of the Inner Austrian line of the Habsburgs. The royalty lived in the Schloßberg castle and from there ruled Styria, Carinthia, most of today's Slovenia and parts of Italy (Carniola, Gorizia and Gradisca, Trieste). In the 16th century, the city's design and planning were primarily controlled by Italian Renaissance architects and artists. One of the most famous buildings built in this style is the Landhaus, designed by Domenico dell'Allio, and used by the local rulers as a governmental headquarters. The astronomer Johannes Kepler lived in Graz for a short period. There, he worked as a math teacher, but found time to study astronomy. He left Graz to go to Prague when Lutherans were banned from the city. Karl-Franzens Universität, also called the University of Graz, is the city's oldest university, founded in 1585 by Archduke Charles II. For most of its existence it was controlled by the Catholic church, and was closed in 1782 by Joseph II in an attempt to gain state control over educational institutions. Joseph II transformed it into a lyceum where civil servants and medical personnel were trained. In 1827 it was re-instituted as a university by Emperor Franz I, thus gaining the name 'Karl-Franzens Universität,' meaning 'Charles-Francis University.' Over 30,000 students currently study at this university. Nikola Tesla studied electrical engineering at the Polytechnic in Graz in 1875. Nobel Laureate Otto Loewi taught at the University of Graz from 1909 until 1938. Ivo Andric, the 1961 Nobel Prize for Literature Laureate obtained his doctorate at the University of Graz. Johannes Kepler was a professor of mathematics at the University of Graz. Erwin Schrödinger was briefly chancellor of the University of Graz in 1936. Adolf Hitler was given a warm welcome when he visited in 1938, the year Austria was annexed by Nazi Germany. The thriving Jewish community was destroyed by the Nazis, and their grand synagogue was burnt. A small group of Graz Jews returned despite everything after the war. In 2000, on the anniversary of the Reichskristallnacht, Graz city council presented the Jewish community with a new synagogue as a gesture of reconciliation. Hitler promised the people of Graz 1,000 years of prosperity and an end to mass unemployment: only seven years later the Graz resistance surrendered the city to Soviet troops, sparing Graz any further destruction. By then about 16% of buildings had been destroyed by Allied bombing - luckily the Old Town was not seriously hit. Graz lies in Styria, or Steiermark in German. Mark is an old German word indicating a large area of land used as a defensive border, in which the peasantry are taught how to organize and fight in the case of an invasion. With a strategic location at the head of the open and fertile Mur valley, Graz was often assaulted (unsuccessfully), e.g. by the Hungarians under Matthias Corvinus in 1481, and by the Ottoman Turks in 1529 and 1532. Apart from the Riegersburg, the Schloßberg was the only fortification in the region that never fell to the Ottoman Turks. Graz is home to the region's provincial armory, which is the world's largest historical collection of Baroque weaponry. It has been preserved since 1551, and displays over 30,000 items. From the earlier part of the 15th century Graz was the residence of the younger branch of the Habsburgs, which succeeded to the imperial throne in 1619 in the person of Emperor Ferdinand II, who moved the capital to Vienna. New fortifications were built on the Schlossberg at the end of the 16th century. Napoleon's army occupied Graz in 1797. In 1809 the city withstood another assault by the French army. During this attack, the commanding officer in the fortress was ordered to defend it with about 900 men against Napoleon's army of about 3,000. He successfully defended the Schloßberg against eight attacks, but they were forced to give up after the Grande Armée occupied Vienna and the Emperor ordered to surrender. Following the defeat of Austria by Napoleonic forces at the Battle of Wagram in 1809, the fortifications were demolished using explosives, as stipulated in the Peace of Schönbrunn of the same year. The belltower and the civic clock tower, often used as the symbol of Graz, were spared after the people of Graz paid a ransom for their preservation. Archduke Charles II of Inner Austria had 20,000 Protestant books burned in the square of what is now a mental hospital, and succeeded in returning Styria to the authority of the Holy See. Archduke Franz Ferdinand was born in Graz, in what is now the Stadtmuseum (city museum). The population (with principal residence status) in the agglomeration was about 320,000 at the end of 2006. 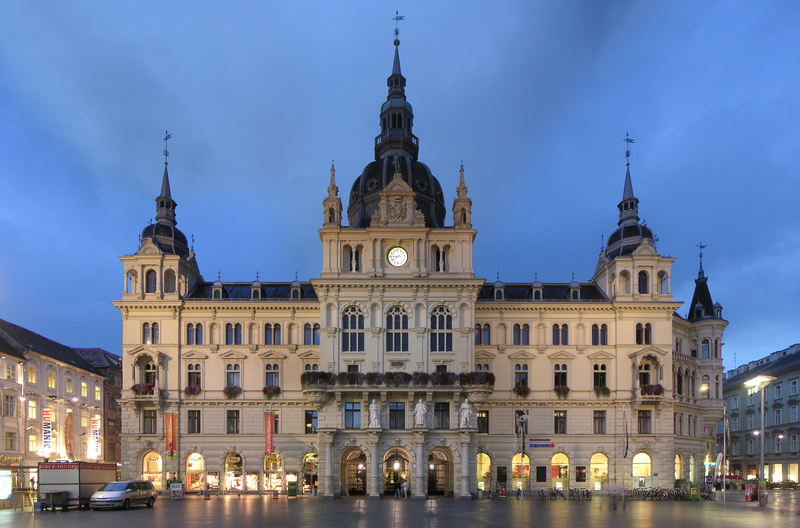 The name of Graz is undoubtedly of Slovene origin and the city was Slovene for a short period. Politically, culturally, scientifically and religiously, Graz was an important centre for all Slovenes, especially from the establishment of the University of Graz in 1586 until the establishment of University of Ljubljana in 1919. In 1574, the first Slovene Catholic book was published in Graz, and in 1592, Hieronymus Megiser published in Graz the book Dictionarium quatuor linguarum, the first multilingual dictionary of Slovene. Styrian Slovenes did not feel Graz a German city, but their own, a place to study while living at their relatives' homes and to fulfill one's career ambitions. Student associations in Graz were a forge of Slovenehood and Slovene students in Graz were more nationally aware than some others. This led to fierce anti-Slovene efforts of German nationalists in Graz before and during World War II. Nowadays, the city is cosmopolitan and quite fond of Slovenes. Many Slovenian Styrians study there. Slovenes are among professors at the Institute for Jazz in Graz. Numerous Slovenes had found employment there, while being formally unemployed in Slovenia. For Slovene culture, Graz remains permanently important due to its university and the Universalmuseum Joanneum archives containing numerous documents from the Slovenian Styria. A symposium on the relation of Graz and Slovenes was held in Graz in 2010, at the occasion of the 200th anniversary of the establishment of the first and oldest chair of Slovene. It was established at the Lyzeum of Graz in July 1811 on the initiative of Janez Nepomuk Primic. A collection of lectures on the topic was published. The Post of Slovenia commemorated the anniversary with a stamp. In the last few years some strikingly modern new public buildings have been erected in the city. The most famous include the Kunsthaus (house of modern art) designed by Peter Cook and Colin Fournier, a museum constructed right next to the river Mur, and the "Murinsel" (island in the Mur), an island made of steel, situated in the river. It was designed by the American architect Vito Acconci and contains a café, an open-air theatre and a playground. Neue Galerie . Museum of art. Calvary Hill in the Gösting area of Graz with a 17th century calvary and church. 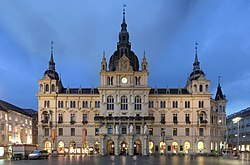 During 2003 Graz held the title of "European Capital of Culture" and is (as of 2011) one of the UNESCO "Cities of Design." Schloss Eggenberg (Graz) with Alte Galerie (paintings and sculptures from the Romanesque to the end of the Baroque period), Coin Collection, Lapidarium (Roman stonework collection),Archeological Museum (featuring the Cult Wagon of Strettweg) a special exhibitions area and the 90,000 m2 romantic landscape gardens. Neue Galerie visual arts from the 19th and 20th centuries. Grazer Kunsthaus exhibition hall of contemporary art. Forum Stadtpark museum of contemporary art. Camera Austria museum of contemporary photography. Landeszeughaus medieval armory comprising 32,000 pieces of armour and weaponry, largest of its kind in the world. Volkskundemuseum museum of folk culture and lore. Diözesanmuseum museum of the Roman Catholic Church. Künstlerhaus exhibition hall of contemporary visual arts. Literaturhaus museum of contemporary German literature. Museum der Wahrnehmung museum of the senses, samadhi bath. Kindermuseum Frida&Fred museum for children. Tramwaymuseum 40 historic trams, the oldest dating from 1873. Luftfahrtmuseum (Graz airport) aviation museum. Hanns Schell Collection key and lock museum, largest of its kind in the world. There are currently 228 buildings in Graz that are classified as high-rise: the floor of at least one room is 22 metres above ground level. Such buildings have to adhere to much more stringent fire safety regulations because the ladders of the majority of fire appliances used by Graz Fire Brigade cannot reach higher than 22 metres. There are some new high-rise buildings in the pipeline; the only ones that currently (June 2009) seem certain to be built are a 15-storey office block opposite the "Stadthalle" on the southern edge of the city centre and a 21-storey officeblock next to the motorway leading from the Graz Ost Interchange (road) into town. An extensive public transportation network makes Graz an easy city to navigate without a car. The city has a comprehensive bus network, complementing the Graz tram network consisting of six lines, two of which run from the main train station (Hauptbahnhof) to the old town before branching out. Furthermore, there are seven night-time bus routes, although these run only at weekends and on evenings preceding public holidays. The tram is also called "Bim". From the main train station (Graz Hauptbahnhof), regional trains link to most of Styria. Direct trains also run to most major cities nearby including Vienna, Salzburg, Innsbruck, Maribor and Ljubljana in Slovenia, Zagreb in Croatia, Prague in the Czech Republic, Budapest in Hungary and Zürich in Switzerland. Trains for Vienna leave every hour. Graz Airport is about 10 kilometres south of the city centre and has a railway station within walking distance (east of the airport). The main hubs Graz Airport is connected with Frankfurt and Munich in Germany and Vienna. Main cities connected to Graz Airport are London (Ryanair) and Berlin (Airberlin). Furthermore there is the geriatric hospital Albert-Schweitzer-Klinik in the west of the city with 304 beds, the Krankenhaus der Barmherzigen Brüder I in Lend with 225 beds, the Krankenhaus der Barmherzigen Brüder II in Eggenberg with 260 beds and the Krankenhaus der Elisabethinen in Gries with 182 beds. EMS in Graz is provided solely by the Austrian Red Cross. Perpetually two emergency doctor's cars (NEF - Notarzteinsatzfahrzeug), two NAWs (Notarztwagen - ambulances staffed with a doctor in addition to regular personnel) and about 30 RTWs (Rettungswagen - regular ambulances) are on standby. Furthermore, several non-emergency ambulances (KTW - Krankentransportwagen) and a Mobile Intensive Care Unit (MICU) are operated by the Red Cross in order to organise transportation of non-emergency patients to and between hospitals. In addition to the Red Cross the Arbeiter-Samariter-Bund Österreichs (Labor-Samaritan-Alliance), the Malteser Hospitaldienst Austria (the Austrian organisation of the Order of Malta Ambulance Corps) and the Grünes Kreuz (Green Cross) operate various non-emergency ambulances (KTW) for non-emergency patient transportation. In addition to the land-ambulances there's also the C12 air ambulance helicopter stationed at Graz airport, which is also staffed with an emergency doctor in addition to regular personnel. Arnold Schwarzenegger, former bodybuilding champion, actor and former governor of California. Born and raised in the farming village Thal, 2 km from Graz. In 2005, the Graz football stadium named after Schwarzenegger was renamed Stadion Graz-Liebenau after controversy over the use of the death penalty in California; now it is called the UPC-Arena. Leopold von Sacher-Masoch, writer and journalist, studied in Graz. The term masochism is derived from his name. Johann Bernhard Fischer von Erlach, architect of the Baroque period. Johann Puch, Slovenian inventor, mechanic and vehicle producer. Ludwig Boltzmann, Austrian physicist, Professor of Mathematical Physics at the University of Graz (1869), chair of Experimental Physics at the University of Graz (1876–1890). Robert Stolz, Austrian composer and conductor. Friedrich St. Florian, Austrian-American architect. Olga Neuwirth, one of the most important contemporary Austrian composers. Nicolaus Harnoncourt, born in Berlin and raised in Graz, a conductor known for his performances of classical works on period instruments. Jochen Rindt, the first Austrian Formula One champion raised in Graz by his grandmother. Otto Wanz, former professional wrestler who held the AWA World Heavyweight Championship. Werner Schwab, playwright and visual artist. Thomas Vanek, professional hockey player, born in Baden bei Wien, raised in Graz. Emanuel Pogatetz, Middlesbrough F.C. defender and captain. August Musger, inventor of the slow motion technique in cinema. Karl Böhm, an Austrian conductor. Otto Loewi Nobel prize-winning physiologist. Archduke Franz Ferdinand of Austria, Archduke of Austria-Este and heir to the Austro-Hungarian throne. Nikola Tesla studied electrical engineering in Graz. Baron Roman Ungern von Sternberg, a prominent figure in the Russian White movement and dictator of Mongolia in 1921. Anton Rintelen, Cabinet Minister and Nazi conspirator. Manfred Hoeberl, Powerlifter and Strongman. Elisabeth Eberl, Olympic javelin thrower. Michael Gspurning, current goalkeeper for the Seattle Sounders FC in the MLS. ^ "Anwesende Bevölkerung nach Wohnsitz und Gechlecht pro Bezirk - Stand 1. April 2010" (in German). Graz: Stadt Graz - Präsidialamt. http://www1.graz.at/Statistik/Bev%C3%B6lkerung/aktuelles_quartal.pdf. Retrieved 7 May 2010. ^ a b c d Granda, Stane (2006). "Gradec in Slovenci" (in Slovene, with a short abstract in English). Traditiones (University of Graz) 35 (2): pp. 99-103. http://isn.zrc-sazu.si/files/file/Traditiones/Traditiones_35_2_Krek_separati/TR352%20099-103%20Granda.pdf. Retrieved 17 December 2010 (via Google Documents; ). ^ a b c Strobl, Alexander (8 July 2008). "A Short History of the City". Graz: Stadt Graz - Magistratsdirektion, Abteilung für Öffentlichkeitsarbeit.. http://www.graz.at/cms/ziel/606777/EN/. Retrieved 7 May 2010. ^ Tautscher, Sonja (7 January 2010). "Graz in Numbers". Graz: Stadt Graz - Magistratsdirektion, Abteilung für Öffentlichkeitsarbeit. http://www.graz.at/cms/ziel/606066/EN/. Retrieved 7 May 2010. ^ "Ein Blick auf die Gemeinde Graz <60101>" (in German). Statistik Austria. http://www.statistik.at/blickgem/blick1/g60101.pdf. Retrieved 7 May 2010. ^ "Klimadaten von Österreich 1971-2000 -Graz-Uni" (in German). Central Institute for Meteorology and Geodynamics. http://www.zamg.ac.at/fix/klima/oe71-00/klima2000/klimadaten_oesterreich_1971_frame1.htm. Retrieved 2012-09-06. ^ (January–March 2002) "Janez Nepomuk Primic in ustanovitev stolice za slovenski jezik na liceju v Gradcu 1811" (in Slovene, with an English summary). Slavistična revija [Journal of Slavic Linguistics] 50 (1). ISSN 1855-7570. ^ Bračič, Bojan (November/December 2011). "Predstavitev znamke v baročni dvorani graškega semenišča". Razgledi: glasilo Pošte Slovenije [Views: The Bulletin of the Post of Slovenia]. ISSN 1318-5075. ^ a b c d e f g h i j k l "Twin Towns - Graz Online - English Version". www.graz.at. http://www.graz.at/cms/beitrag/10045157/606819/. Retrieved 2010-01-05. ^ "Stadt Graz: Sister Cities". http://www.graz.at/cms/beitrag/10099866/606819. Retrieved 2008-12-01. "Graz: Stadtplanung und Stadtentwicklung (Rechnungshofbericht, 2006) in German" (PDF). 2006. http://www.rechnungshof.gv.at/fileadmin/downloads/Teilberichte/Steiermark/Steiermark_2006_02/Steiermark_2006_02_1.pdf. Retrieved 2008-04-08. This page uses content from the English language Wikipedia. The original content was at Graz. The list of authors can be seen in the page history. As with this Familypedia wiki, the content of Wikipedia is available under the Creative Commons License.